LOS ANGELES, California, February 1, 2013 (ENS) – A federal grand jury has returned a nine-count indictment that charges a now-shuttered Santa Monica sushi restaurant and two men who worked there as chefs with selling meat from endangered sei whales, which are protected under the Marine Mammal Protection Act. The indictment describes a conspiracy that lasted from 2007 into 2010. It charges Typhoon Restaurant, Inc., the parent company of the now-closed The Hump Restaurant, which was located at the Santa Monica Airport. Charges were also filed against California residents Kiyoshiro Yamamoto, 48, of Culver City and Susumu Ueda, 39, of Lawndale. The indictment accuses the three defendants of conspiring to import and sell whale meat. If they are convicted, Yamamoto would face a statutory maximum penalty of 67 years in federal prison, and Ueda would face a statutory maximum sentence of 10 years. If convicted, Typhoon Restaurant, Inc. would face fines totaling $1.2 million. Yamamoto and Ueda allegedly ordered the whale meat from Ginichi Ohira, a Japanese national who previously pleaded guilty to a misdemeanor charge of illegally selling a marine mammal product. According to the indictment and previously filed documents, The Hump sold whale sushi to informants posing as customers on three specific occasions in the fall of 2009 and in early 2010. The meat sold as “whale” on two of the occasions was examined by scientists, who tested the DNA of the meat and determined it was sei whale, and receipts given to the informants who went to The Hump indicated that they had purchased “whale,” according to an affidavit previously filed. 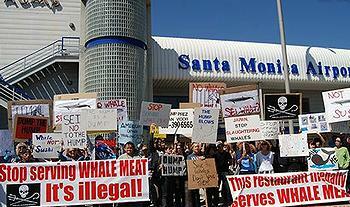 It is illegal to sell any kind of whale meat in the United States. Sei whales are protected under the Marine Mammal Protection Act of 1972 and they are listed as endangered in the Endangered Species Act of 1973. In addition to the conspiracy charge, The Hump is charged with smuggling and Yamamoto is charged with two counts of smuggling. The Hump is also charged with a misdemeanor count of the sale of a marine mammal product for an unauthorized purpose, and Yamamoto is charged with two misdemeanor counts of sale of a marine mammal product for an unauthorized purpose. Yamamoto is charged with obstructing an official proceeding for allegedly instructing other sushi chefs at The Hump to lie about the source of the whale meat. Ueda is charged with making a false statement to federal investigators about the source of the whale meat. The investigation into The Hump was started after members of the general public brought information to NOAA. Back in 2010, Sea Shepherd activist, pelican rescuer and lead singer for Pennywise, Zoli Teglas, discovered that the Hump Restaurant in Santa Monica was serving whale meat to special customers. Sea Shepherd responded with an investigation and sent in undercover activists to gain the trust of the exclusive sushi restaurant until they were able to become special customers. Whale sushi was ordered and pieces of the whale were placed in plastic bags for DNA analysis. The tests proved that the meat was from sei whales. Sea Shepherd and OPS worked with the United States government to send activists back into the Hump wired with microphones to secure further evidence. This evidence led to the shutting down of the Hump Restaurant at the Santa Monica Airport. The investigation into The Hump and Yamamoto was conducted by the National Oceanic and Atmospheric Administration, Office of Law Enforcement. NOAA investigators received assistance from the U.S. Fish and Wildlife Service, the California Department of Fish & Game, and U.S. Customs and Border Protection. Anyone with information about the illegal sale of marine mammals is encouraged to call the NOAA Law Enforcement hotline at (800) 853-1964. The IUCN Red List of Threatened Species classifies sei whales as Endangered. The last assessment of North Pacific Sei Whales by the International Whaling Commission Scientific Committee was in 1974. The population of adult sei whales was estimated to have declined from 42,000 in 1963 to 8,600 in 1974. Over 40,000 sei whales were caught during this period.